Information: Now consisting of four cards per pack, 2000 started off with a new entry in the Tatsunoko Time Capsule series. The cards were packaged in a resealable plastic bag. This set featured one "Gatchaman" postcard, with an image that had been originally used on the Gatchaman BGM LP. It was drawn by Ippei Kuri. 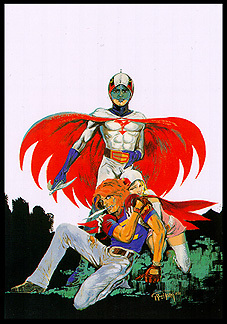 With the purchase of these new postcards and/or any of the previously-available packs, the buyer was given sealed packs of promotional "Millennium Premium - Tatsunoko Time Capsule - Tatsunoko Trading Cards 2000," which actually came out in early 2001. For more information and pictures of these special Gatchaman cards, click here.